2015 marks a significant year for Avo Cigars as has undergone a makeover featuring new banding, packaging, and a streamlining of the portfolio. As a part of the makeover, the annual Avo Limited Edition Series also underwent a change. 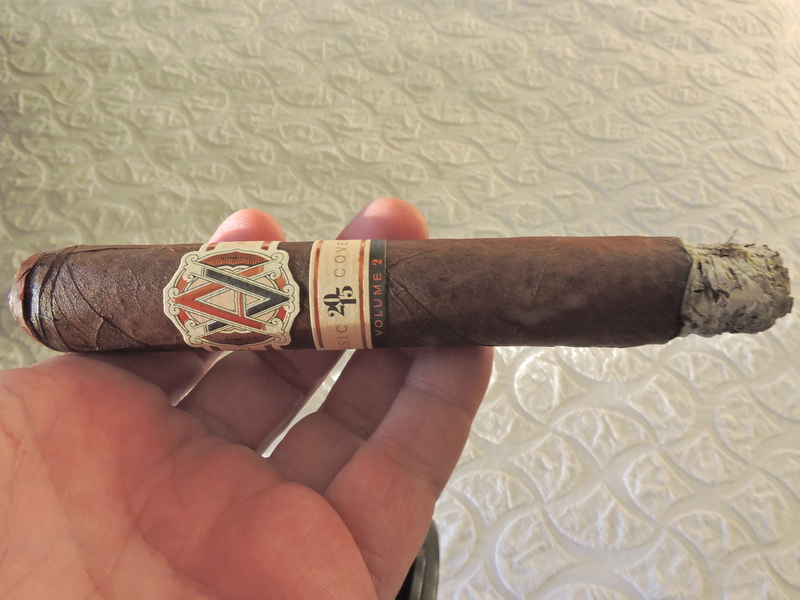 From 2001 through 2014, Avo Cigar enthusiasts could always look forward to an Avo Cigar on brand ambassador Avo Uvezian’s March 22nd birthday, but in 2015 that would change. A new concept for the Avo Limited Edition series was launched called the Avo Improvisation Series. Back in April the first installment of this series, Avo Classic Covers 2015 (i.e. Volume 1) was released. At the 2015 IPCPR Trade Show, the second installment of this series – Avo Classic Covers Volume 2 was unveiled. This cigar made its way to retailers in September. Recently, I’ve had an opportunity to smoke the new Avo Classic Covers Volume 2. I was real impressed with Avo Classic Covers Volume 1, but with Avo Classic Covers Volume 2, I found the another excellent installment to this series. The concept of the Avo Improvisation Series is to draw inspirations from previous Avo releases to create a whole new cigar. The concept is similar to the relationship of a cover song to an original song. With Avo Classic Covers Volume 1, the inspiration was drawn from the Avo Classic blend. Tobaccos from the Avo Classic were incorporated from that blend and a whole new cigar was created. Now with Avo Classic Covers Volume 2, tobaccos from the Avo Heritage were incorporated to create a whole new blend. Since Avo Heritage was based off the Avo Limited Edition 2009 Companero, it is somewhat safe to say there is a lineage between Avo Classic Covers Volume 2 and the Companero. There is some creative packaging that has been done with Classic Covers Volume 2. The cigars are packaged in a round box shaped like an album. 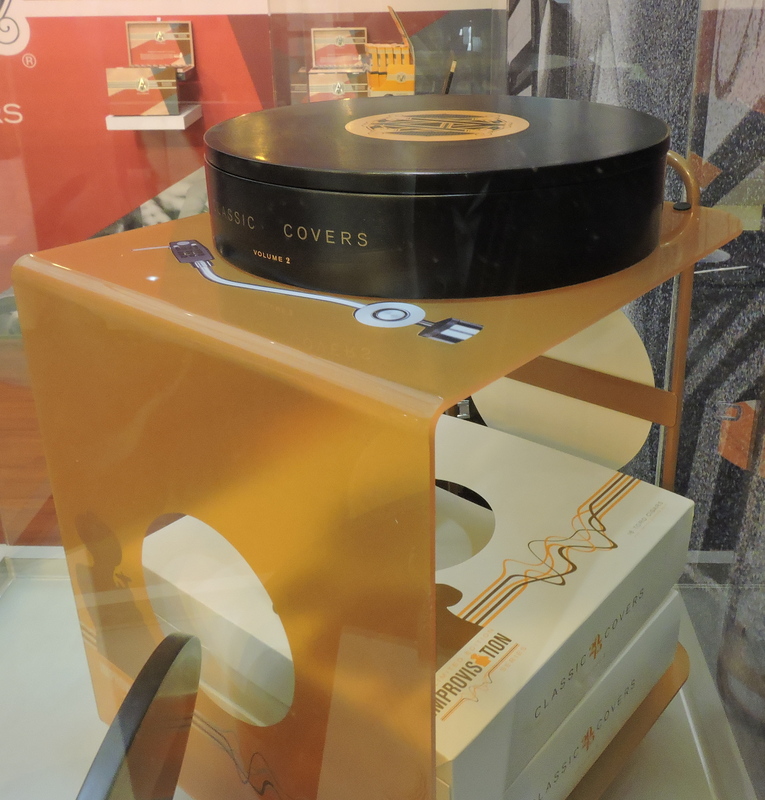 A display unit looking like “stacked albums” was also made available to retailers. 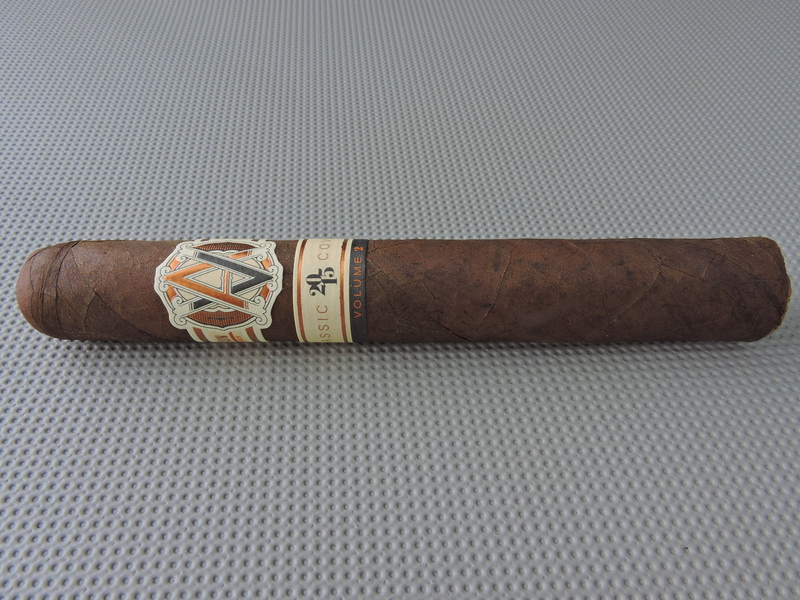 Without further ado, let’s “cover” the Avo Classic Covers Volume 2 and see what this cigar brings to the table. Avo Classic Covers Volume 2 starts with the Dominican tobaccos in the Avo Heritage. It incorporates tobacco from Nicaragua (this is the third Avo blend to do so), as well as a Mexican binder. The cigar is finished with an Ecuadorian 702 Marron wrapper. The Avo Classic Covers Vol. 2 is available in one size – a 6 x 54. The cigars are packaged in 16 count boxes. The total production total of 3,500 boxes. Distribution is limited to the U.S. only. The Ecuador 702 Marron wrapper of Avo Classic Covers Volume 2 is one of the darker wrappers that has been released under the Avo brand. The wrapper has a rich coffee bean color. Upon closer examination there is some darker marbling that can be seen. There is a light coating of oil on the surface of the wrapper. There are thin visible veins. The darker color of the wrapper does a good job at hiding most of the wrapper seams on on the surface. The banding of the Avo Classic Covers Volume 2 is similar but not the same as Volume 1. The band has has an antique white background. On the band is a copper, black, and antique white colored Avo logo using the tweaked design that was done as a part of the rebranding. To the right is the text “AVO UVEZIAN” in copper font on a cream colored background. To the left the logo for the Avo Improvisation Series. This logo feats “IMPROVISATION” in copper font with an orange Avo Uvezian Silhoutte being used in place of the letter “A”. Below that is the text “SERIES” in small copper font. The text and design on the left and right side of the band for Volume 2 is reversed from Volume 1. There is a secondary band that is also cream colored. It features a copper stripe across the top and bottom. The center of the band features a black “2015” arranged in a diamond-like pattern. To the left of the “2015” is the text “CLASSIC” in copper font. To the right of the “2015” is the text “COVERS” in copper font. There is a black stripe on the bottom of the band with the text “VOLUME 2” in small copper font. As I normally do with most of my cigars, I started the cigar experience with a straight cut. Once the cap was successfully clipped I moved on to the pre-light draw. The dry draw provided a mix of leather, earth, and a slight cedar note. Overall, I considered the pre-light draw to the Avo Classic Covers Volume 2 to be satisfactory. At this point I was ready to light up my cigar and see what the cigar experience would have in store. The Avo Classic Covers Volume 2 started out with a mix of black pepper and cedar. I found the spice didn’t subside in the early stages, but notes of earth quickly joined them in the forefront. There were also some notes of coffee, nut, and citrus that were present in the background. Meanwhile, the pepper notes were quite prominent in the forefront. By the later part of the first third of the Avo Classic Coverts Volume 2, the spice notes started to recede. The coffee notes increased and joined the earth notes in the forefront. Moving toward the end of the first third, the coffee notes got richer, the spice continued to diminish, and the cigar started to smooth out. The nut flavors were in the background with the spice and the citrus component dissipated. During the second third, the coffee notes continued to get richer. There was also a dark chocolate component that surfaced from time to time. The earth notes were now in the background with the spices. There was also now an underlying creaminess in the background. The nut notes were more distant. By the last third of the Avo Classic Covers Volume 2, the rich coffee and dark chocolate notes remained in the forefront. The spices increased again and joined these notes in the forefront with mostly a pepper component. There were still a slight amount of nut and earth notes in the background. The cigar lost some of its smoothness creamy component did significantly decrease during this stage, however the flavors remained rich. This is the way the cigar experience remained until the end. The resulting nub was lukewarm and slightly soft to the touch. Overall the burn of the Avo Classic Cover had a straight burn path from start to finish. The burn line was a little irregular, but this didn’t prove to be problem-some and some touch-ups seemed to fix it. I didn’t find this cigar needed an abnormal amount of touch-ups to maintain a uniform burn. The ash was a charcoal gray color. This was a looser ash than I prefer, but there was some minor flaking along the way. The burn rate was ideal. Keeping the burn temperature ideal did prove to be a little more work as I found the draw to be a little loose. I did find I had to ease up on this draw a few times though. By doing this I was able to keep the burn performing at a cooler temperature. This is a cigar that shouldn’t be rushed. If it’s smoked nice and slow, it will provide a very good experience and give maximum enjoyment. While I found Volume 1 to be on the fuller side, I still found Classic Covers Volume 2 to be one of the bolder Avo Cigars that has been released. While it is not quite at the level of the Avo LE 10, it is going to come pretty close. I found Volume 2 started out medium to full strength right out of the gate and by the second half, the strength had moved into full territory. Meanwhile the flavors had some nice weight on the palate. The body followed a similar path as to the strength – namely starting out medium to full before becoming full-bodied in the second half. In terms of strength versus body, I found both attributes balanced each other really nicely. When I first started smoking the Avo Classic Covers Volume 2, I thought this was going to be a rough, gritty smoke. I was amazed this cigar smoothed out in the second third. I also really liked how rich the flavors got during this stage of the cigar. Some of the smoothness of the flavors were lost in the last third, but not the richness. As mentioned earlier, this cigar did require a little more maintenance to keep the cigar from burning warm. I found the extra effort to be well worth it here as this delivered. This isn’t going to have a flavor profile like your typical Avo cigar. While it won’t have the grassy and herbal notes common to many of the blends, it is going to deliver wonderful, rich flavors of coffee and chocolate – and deliver a little more in the way of spice. This is a cigar I’d steer more toward the experienced cigar enthusiast. As for myself, this is easily a cigar I’d smoke again. It’s box worthy and has a lot of potential to go higher with some more age.